It is getting on towards the end of the semester, which means that I have piles of work to do and not nearly enough time in which to do it. There are several topic that I would really like to write about, but other matters are more pressing. That being said, ensuring that I have a new image for each Monday is a priority. Today’s image is a bit of a quickie. 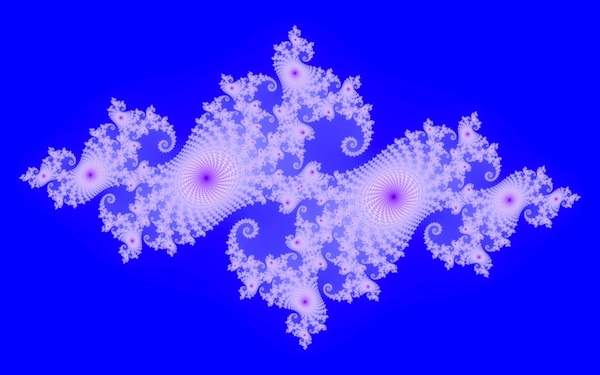 It is another Julia set, this time centered in Seahorse Valley. The seahorse forms of the Mandelbrot set are reproduced here, as are the spiral features (seen in purple here, or as alternating bands of blue and yellow in the post linked above). To be honest, I don’t have much more to say about this week’s image—I need to get back to solving systems of ugly, ugly differential equations. This entry was posted in MMM and tagged Art, Fractals, MMM. Bookmark the permalink.